We love Toronto weddings. The variety of wedding venues in this city is truly astonishing. Waterfront venues, a castle, a theatre, historic distillery, world class hotels, and so many other amazing choices: and of course, an elegant Georgian Manor discreetly located (unknown to many) in North York. One of the premiere wedding venues in Toronto, Graydon Hall Manor is definitely one of our favorites – our wedding videography artfully captures it’s stately architecture, verdant gardens and romantic air. This beautiful place was the setting for Kaitlin & Adil’s wedding. While Graydon Hall is an amazing spot, all eyes were on Kaitlin and Adil on their day. Like all of our wedding couples, they are wonderful, warm people… the kind of people that other people want to be around. These Toronto wedding videographers were thrilled to film it all. It was a perfect day, and there were so many amazing moments that we couldn’t include them all in their highlights film, but we think we did pretty well! Melissa and Chris chose the fashionable Ritz-Carlton, Toronto for their wedding day and it was a truly beautiful event. We had our work cut out for us shooting their wedding film, even with three wedding videographers… there seemed to be no end to the gorgeous styling and decorating. Some of our favorites were the flowering trees throughout the ceremony hall, the gorgeous table settings, the Chinese sedan chair containing the bride, the colorful and noisy lion dancers, the origami decorations, it was a long list. We really enjoyed filming Melissa and Chris’s cinematic wedding video, they are a wonderful couple, and this lavish wedding was one of the highlights of our year. Anne and Stefan came into our lives a mere month before their wedding, and we’re so happy they did. We got to know each other over dinner one evening at Fran’s on Shuter downtown and I was quite taken with their genuine, kind personalities. I knew immediately they would be a joy to work with! Anne & Stefan were married in central Toronto’s Timothy Eaton Memorial Church, a grand church with lofty vaulted ceilings and beautiful stained glass windows. As a Toronto wedding videographer I’ve seen many churches but this one was really impressive (you’ll see what I mean). Following their touching ceremony, we travelled to Alexander Muir Memorial Gardens for the bridal party’s creative video and photo sessions. The Gardens are wedding videography and photography paradise with spots around every corner. Afterwards, we returned to their reception hall at Paradise Banquet Halls in Vaughn for what turned out to be an incredible wedding celebration. The highlight of the evening IMHO had to be Anne and Stefan’s first dance, as they held their audience spellbound, floating across the floor to Ed Sheeran’s “Thinking Out Loud”. Congratulations Anne and Stefan! Enjoy some of the special moments from their wedding day! When we first met with Kathy and George about their wedding videography and wedding video, we knew this was a wedding couple with spark! When we arrived at The Hair Studio at Ashgrove Spa to film bridal prep of Kathy & some of her bridesmaids’ having their hair done, we were greeted by a bride who was totally enthused and in a party mood! That set the tone for a joy filled and exciting wedding day. The couple’s wedding ceremony took place in Markham at St. Nicholas Greek Orthodox Church. When we walked inside for the first time, we were very impressed with the beautiful church murals and mosaics, the unique dome ceiling, rich colors, and dark, rich wood trim everywhere. It made for beautiful wedding cinematography! The ceremony was poignant and sweet, and immediately after, the happy couple were whisked away to downtown Toronto in a white vintage Rolls Royce. As wedding videographers, we love a jaw dropping location for the creative videography session and for interiors, it’s hard to beat the charming Fairmont Royal York Hotel on Front Street. The happy couple rented a gorgeous suite for their wedding photos and cinematography and we captured some stunning shots using steadicam and cinematic slider. An hour later we were shooting video of the elegantly decorated reception hall at the historic Eglinton Grand in midtown Toronto. The room was elegantly decorated with an art deco theme, most stunning were the lofty feather adorned centerpieces and the lavish head tables. The wedding reception was fantastic… one of the highlights of the evening was a surprise performance by an aerialist who provided a Cirque de Soliel type performance, performing breathtaking acrobatic maneuvers some 20 feet directly above the crowd. As you’ll see in this highlights wedding video, this was a wedding full of fun and joy… a wedding to remember! Enjoy! We packed our cameras and wedding videography gear June 19th, leaving Toronto and the GTA bound for Amanda and Devon’s June 21st wedding in Kelowna, British Columbia. The Okanagan valley was stunning – fertile hills dressed in lush vineyards, wineries, fruit orchards – slender, winding Okanagan lake at it’s center – all embraced by tall, gentle, timber-covered mountains. Devon grew up in Kelowna and he and Amanda decided it would be a wonderful setting to be married in. For their wedding venue, they decided on Bottega – a beautiful boutique hotel set above the valley against the mountains. Their wedding day was amazing – a lovely bride, a dashing groom, the glorious weather and everything unfolded perfectly! Wedding videographers are drawn to the incredible beauty and special moments of a wedding… we were incredibly blessed with both at this destination wedding. Some favorite moments our wedding videography captured: the couple’s touching first look in the woods, their lovely outdoor ceremony with it’s poignant champagne toast, and their unique doughnut wedding cake. Special thanks to guest videographer Ryan Tebbutt of Kelowna’s Chelsea Ryan Wedding Cinema who teamed up with our lead wedding videographer John Summerfield to capture the day’s magic. Enjoy Amanda and Devon’s Wedding Highlights film! Isabel and Michael’s wedding theme, basis for their Twitter hash tag, and recent mantra, is their invented phrase, “It’s kind of a big deal!”. We completely agree! It was definitely a big deal. 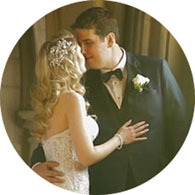 A Toronto wedding videographers, we love the many stunning wedding venues that our wedding couples choose in the city and greater Toronto area. So many beautiful places, and one of our consistent top ten favorites is the stately Liberty Grand, where Isabel and Michael decided to have both their wedding ceremony and reception. After their bridal prep and groom prep, the couple had their touching first look in the courtyard. We then made our way to nearby Liberty Village with it’s restored 19th century architecture for their creative wedding video and wedding photos session. The wedding ceremony was lovely and included beautiful Filipino wedding traditions and customs such as the unity candle, coins, cord, and veil. Amazing couple, amazing venue, amazing wedding day. We hope you enjoy it through our wedding videography and the result, Isabel and Michael’s wedding highlights film. After all…. it’s kind of a big deal! Mia and Mat’s wedding day was situated on the northern edge of the Greater Toronto Area in the Bradford and Newmarket area. As we approached Mia’s location where our wedding videography would begin with her bridal prep, we were struck by the understated beauty of this area. Adjacent to the Holland Marsh, the Oak Ridges Moraine and Lake Simcoe, it’s a rich agricultural area surrounded by beautiful rolling hills and southern Ontario woodlands. It really gives you a smalltown, rural area feeling. At the house where Mia was getting ready, we felt very welcome by her sweet, warm family. Mat, we heard, had been busy washing and babying his pickup truck for the big day and was surrounded by his groomsmen. The Roman Catholic church for Mia and Mat’s wedding ceremony in Bradford was huge and quite beautiful. Our wedding cinematography captured all of their touching ceremony. Mia is of Filipino descent and the lovely Filipino wedding traditions of the coins, cord, and veil were a very important part of their ceremony. When we finally saw the wedding reception venue, we were delighted. Madsen’s in Newmarket is very unique, a very spacious greenhouse setting with trees, and tropical plants of all description everywhere. There’s even a beautiful waterfall inside. Needless to say, it was a beautiful setting for their wedding reception and provided a perfect ending to their wedding day! © 2019 Summerfield Films Wedding Videographers Toronto|ProPhoto Photography Blog|BY THE DESIGN SPACE Co.